Maxtrix Algebra. Determinants, Inverse Matrices, and Rank. Linear, Euclidean, and Unitary Spaces. Linear Transformations and Matrices. Linear Transformations in Unitary Spaces and Simple Matrices. The Jordan Canonical Form: A Geometric Approach. Matrix Polynomials and Normal Forms. The Variational Method. Functions of Matrices. Norms and Bounds for Eigenvalues. Perturbation Theory. Linear Matrix Equations and Generalized Inverses. Stability Problems. Matrix Polynomials. Nonnegative Matrices. Appendix 1. A Survey of Scalar Polynomials. Appendix 2. Some Theorems and Notions from Analysis. Appendix 3. Suggestions for Further Reading. Index. 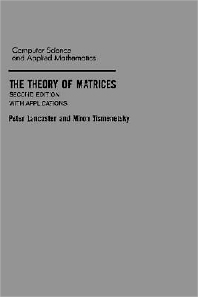 In this book the authors try to bridge the gap between the treatments of matrix theory and linear algebra. It is aimed at graduate and advanced undergraduate students seeking a foundation in mathematics, computer science, or engineering. It will also be useful as a reference book for those working on matrices and linear algebra for use in their scientific work. Undergraduate, and graduate students in a variety of possible programs where this subject matter is required.